On June 17, 1972, a large fire occurred at the former Vendome Hotel building in the Back Bay District. The blaze took about three hours to extinguish. The normal clean-up operation subsequently began, and without any warning, the southeast section of the building collapsed. Nine Boston fire fighters were killed, with eight injured. The heroism and selflessness of fire professionals must always be honored and remembered. A memorial was built to honor the nine fire fighters who lost their lives, and was dedicated on June 17, 1997. 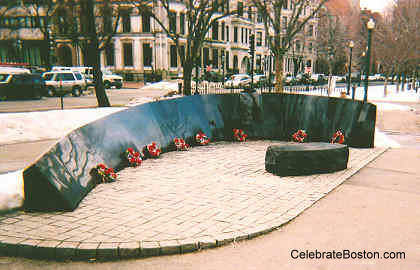 The memorial is a narrow low wall constructed of black granite, and is draped with a bronze fire fighter helmet and coat. A bench rests in front of the memorial, where one can read the inscribed names of the honored fire fighters, and also view the Vendome Hotel building across the street. Thomas J. Carroll, John E. Hanbury Jr., Thomas W. Beckwith, Joseph E. Boucher Jr., Charles E. Dolan, John E. Jameson, Richard B. Magee, Paul J. Murphy, and Joseph P. Saniuk are the fire fighters who made the ultimate sacrifice for the community as a result of the Vendome fire. Eight women were widowed, and twenty-five children lost their fathers as a result of the fire. 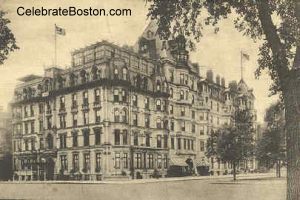 The original Vendome Hotel was often described as luxurious, and even palatial. The building was constructed in 1871, with several additions later made. Many famous people stayed at the Vendome, including Presidents Harrison and Cleveland, and industrial tycoons Andrew Carnegie and John Rockefeller. This author presumes the building remained a hotel until the late 1950s or early 1960s. After the fire, the building was renovated and eventually converted to a condominium. Directly across from the building and opposite the Vendome Hotel Fire Memorial, is the statue of abolitionist William Lloyd Garrison. The firefighters memorial is across Dartmouth Street opposite the Garrison statue.